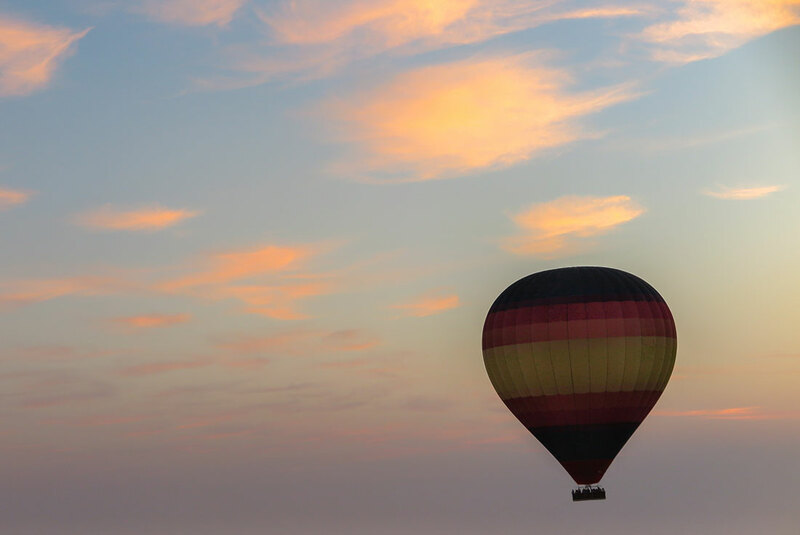 Have you ever flown in a hot air balloon? It’s such a surreal experience, right? 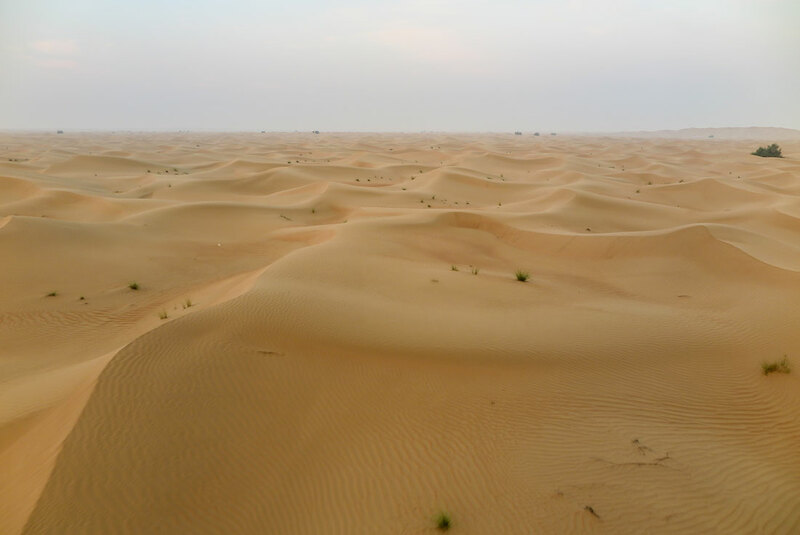 Now, imagine you’re doing it over an incredibly special area, like smooth-looking, golden desert sand. If that doesn’t sound unique enough to you, then picture this: You’re going to be flying as the sun rises. Expect a spectacle of shades and colors that only mother nature can pull off. 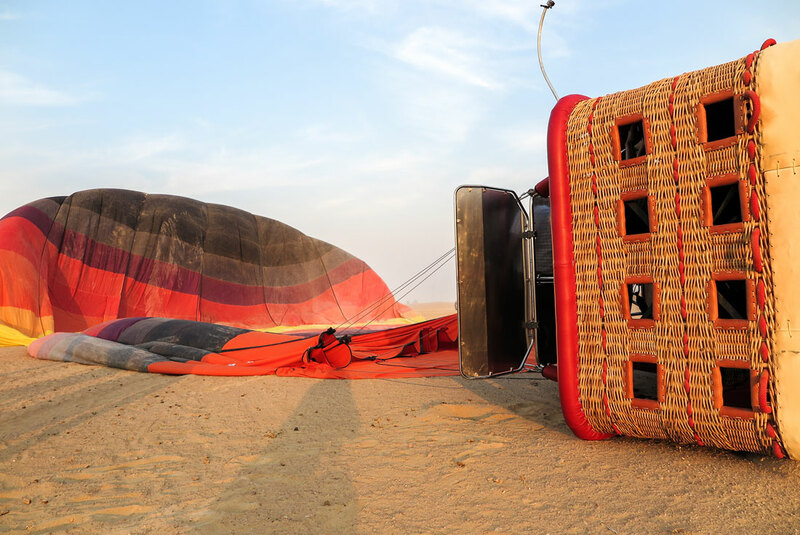 Below I’ll tell you all about my experience of flying a hot air balloon in Dubai, so that you can get a full glimpse of what it’s like. I’ll add all the practical details towards the end and if you fall in love with my words and photos, you’ll know where to book the amazing adventure. When in Dubai, check out also this long list of cheap & free things to do. So you’ve flown. What now? 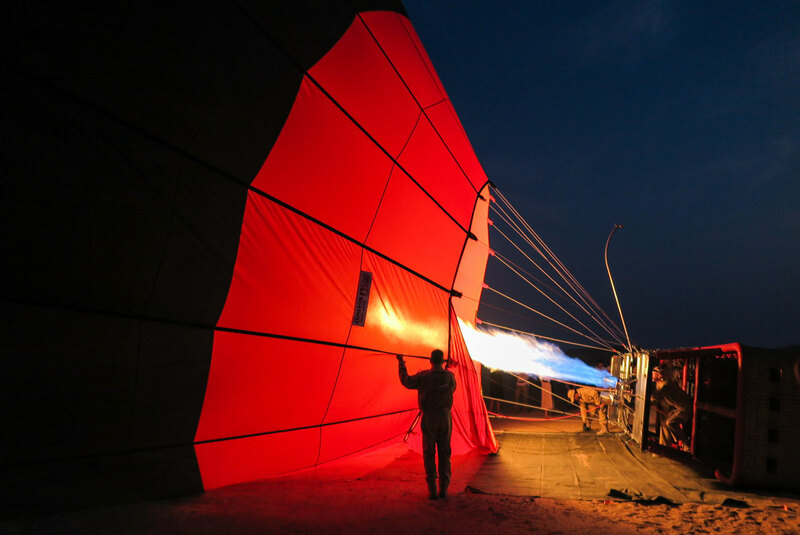 You watch the fabric of the balloon on the ground slowly inflate and rise as the hot air is shovelled in under great pressure. Everyone lines up, with their harnesses on, waiting for the moment when captain Andrew from New Zealand gives a loud and clear sign it’s time to climb into the basket. We each find our little space and excitedly wait for the balloon to lift off fully. It’s taking its time, as if it wasn’t fully awakened yet. Suddenly there’s a subtle whoop – and we’re not touching the ground anymore! First we seem to fly to the sky oh so high! I occasionally check the Captain’s face to make sure there’s no terror reflected there and that everything is still under control. He obviously knows what he’s doing. The highest point we reach is 4,000 feet up (1.2 km). It’s the height when you can’t really tell if that dot on the ground is a person or a camel. Simultaneously, we keep watching the other balloon that took off into the air just after us. At moments, it appears as if we’re in a competition, they seem to be winning at first, but then we overcome them :) I’d assume it’s all thought out and not just a random contest. From high up we descend a few thousand feet down. We’re catching an airstream. Andrew nails it and now we’re just beautifully carried by the airstream, gliding just a few meters above the sand dunes. Our speed is about 9 km/h, but it feels quite fast. Getting ready for the takeoff, still in the dark! The other balloon is just as us only a few metres above the ground. Everyone is using their cameras to the fullest, snapping selfies, shooting videos… because this is definitely one of the moments everybody wants to remember for life. You look around, watching the occasional animal appear below as you keep snapping photos of the gorgeous rising sun that colors everything orange. Suddenly the other balloon appears so the main task at hand is now to fit in the rising sun and the balloon into one photo. The whole experience is… indescribable. On one hand, you feel as free as a bird, on the other hand you’re fascinated by the whole physics of flying. Perhaps you’re even a little scared. Especially if it’s your first hot air balloon ride! 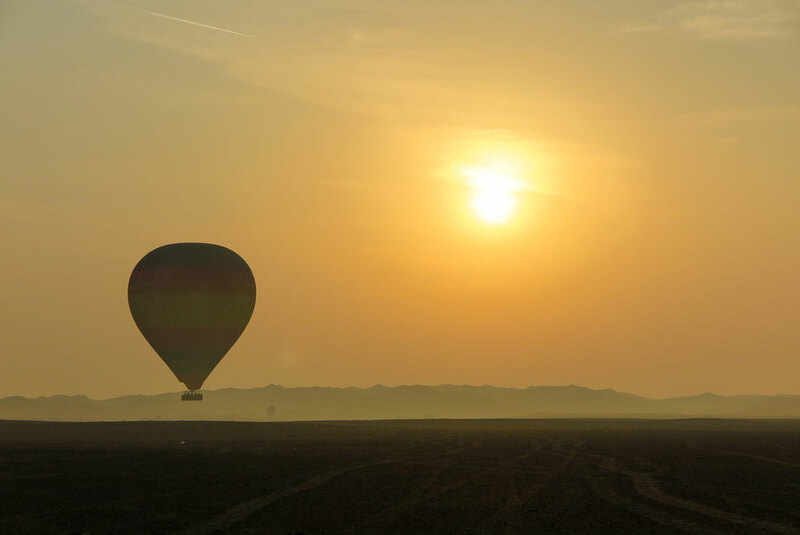 You don’t know what to watch first – there’s the breathtaking sunrise, there’s another hot air balloon up in the air that looks incredibly photogenic and then there’s the landscape – the eternal sand. 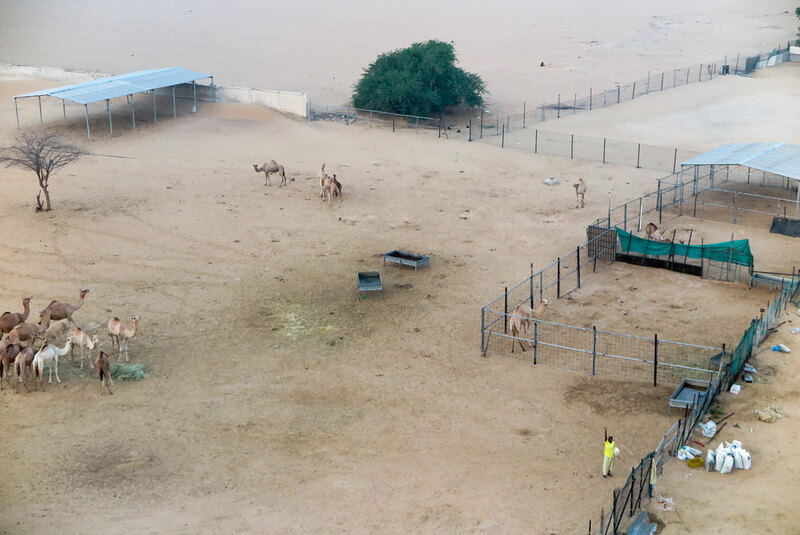 There are oryxes running in the distance on one side, there’s a farm with camels right under you. As we’re enjoying the swift and relaxing ride, Andrew announces we’d be landing soon. In a slight disagreement, we all get into our trained positions with our knees bent and our backs against the side of the basket. Landing in the desert is not a piece of cake, after all! We slightly hit a first dune, second, third, and then we land on the ground. Our basket is dragged along a little, as if the balloon didn’t want to finish the ride just yet. Finally it comes to a stop and guess what – we’re lying on our backs! We landed on the side. Captain Andrew calls it a smooth landing, as we’re all laughing and crawling out of the basket on all fours. Sad for it to be all over, we stood watching the balloon to deflate. Even though the hot air balloon ride was over, the whole experience wasn’t! Back on the ground, safe and sound. It’s not about the balloon only. 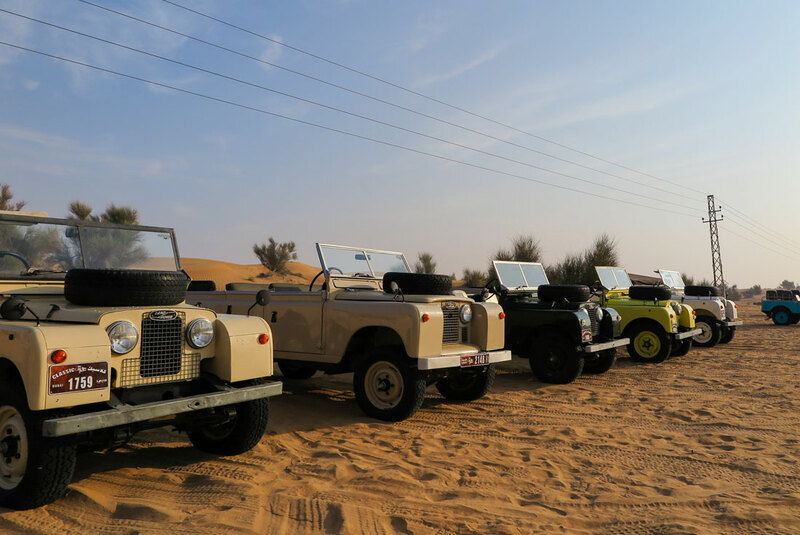 All hot air balloon rides with Balloon Adventures Emirates come with a ride in a vintage 1950’s Land Rovers to a Bedouin camp in the desert where you’ll enjoy some gourmet breakfast. 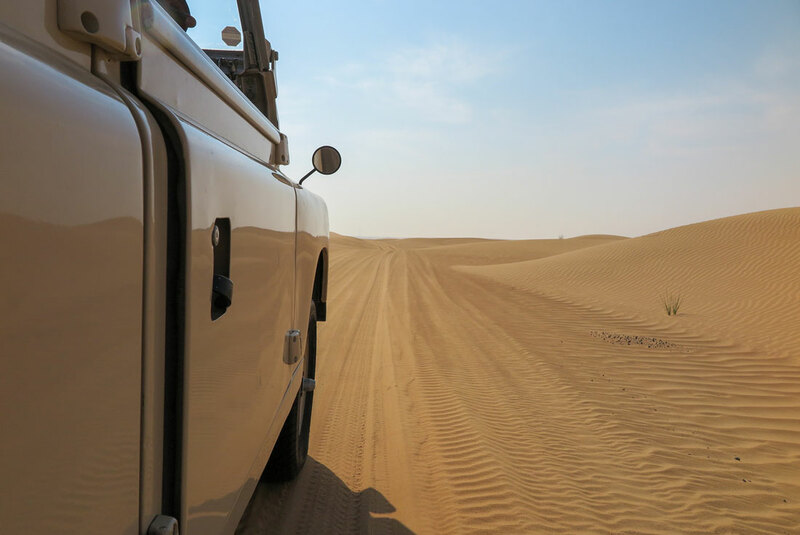 The ride in the old open top Rover is fun enough on itself, as riding on the dunes produces quite some adrenaline. An optional falconry showcase is done right near the breakfast spot, and I can highly recommend it to anyone! 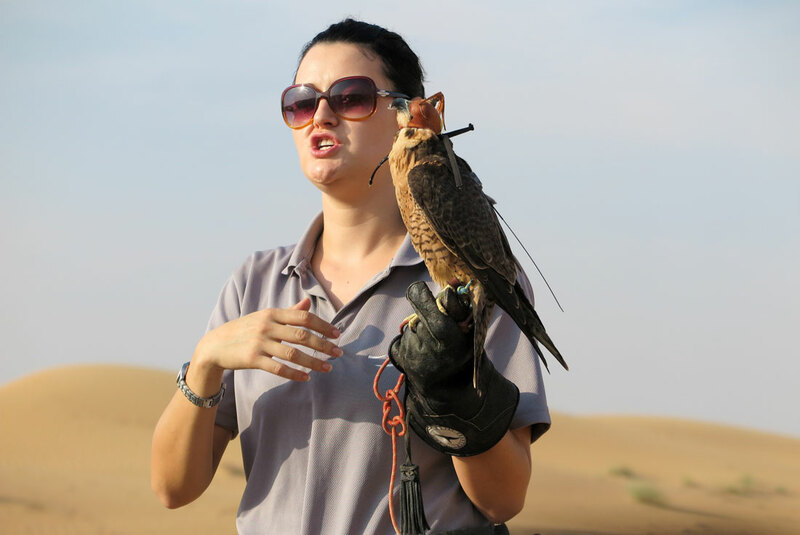 You’ll see an amazing set of skills at play when an expert falconer shows all the possible tricks she can nudge the falcon to do, without using any force. 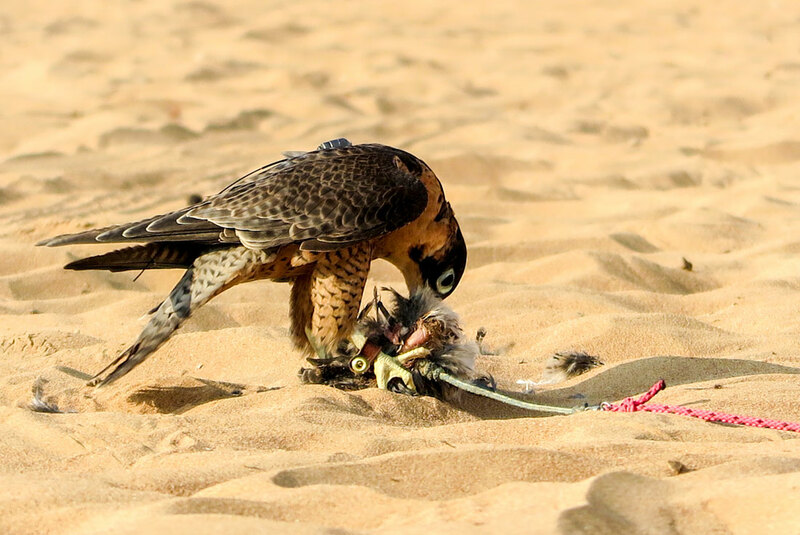 The falcon is rewarded in the end with a nice chunk of meat, after showing us what she’s capable of. What a great way to continue the adventure! 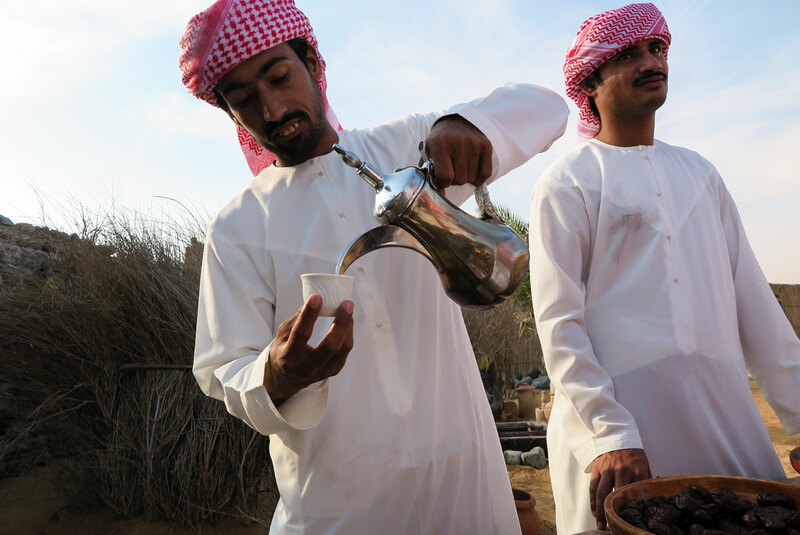 Enjoying original style Bedouin coffee with fresh dates is the typical way of hosting guests in the desert. 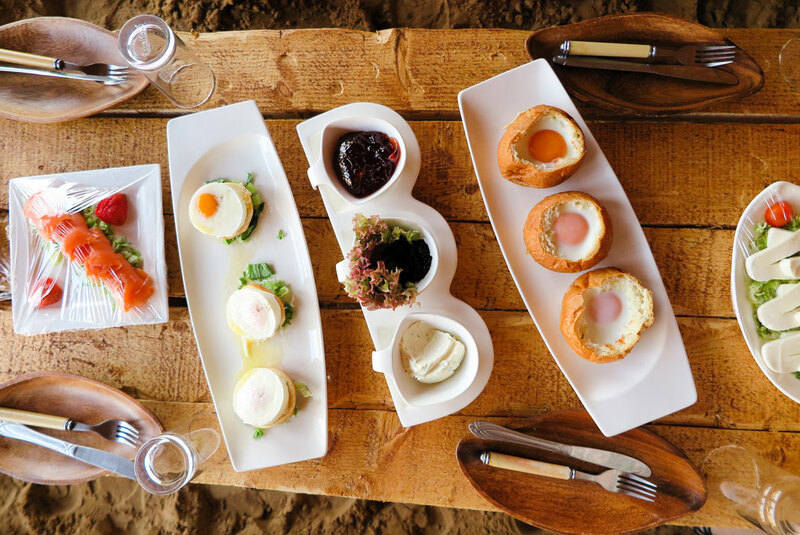 It’s not enough for a breakfast, so you can also look forward to a full scale breakfast featuring all kinds of fruit, eggs, toasts, even smoked salmon and caviar for the real gourmets, all served in an oasis-like enclosure. If you have more time and more curiosity for the desert, I strongly recommend purchasing an add-on: desert safari! The whole combo can be booked via Platinum Heritage Website. It’s an award-winning sister company of Balloon Adventures. Bedouin welcome: Coffee and dates! Even the breakfast exceeded my expectations.. this is only half of what was served! Your guide will help you put a scarf on your head, just like the Bedouins would do. A black one for each lady, who can also use it to cover her face, if she prefers to. Men get a white and red, which covers their head and the neck. Me wearing a shemagh. It’s usually worn by men, while ladies in the desert have a black scarf on their head, but I got the shemagh as I signed up last minute. We were driven around in the old Rover again and our guide Oscar from South Africa would talk to us about the unique Bedouin way of life in the desert. We’d look for all kinds of animals: from the bigger types like gazelles and oryx to little scorpions or lizards. 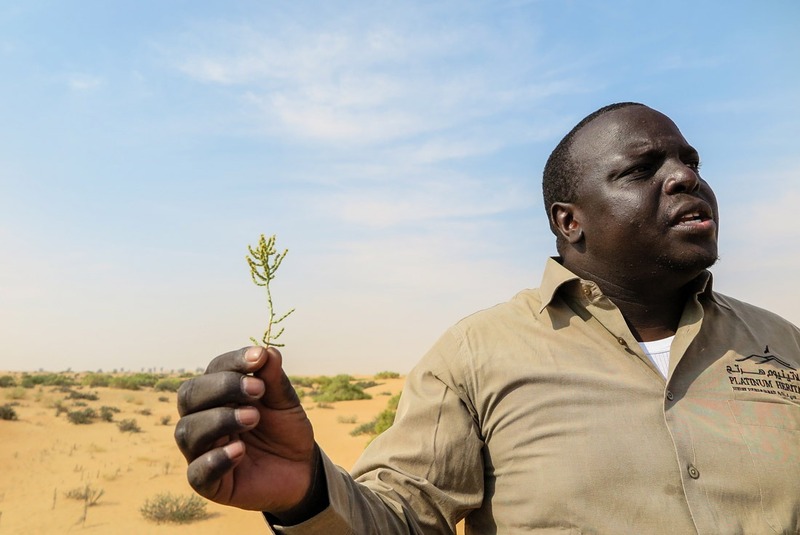 He’d point out different plants to us and their medicinal usage among Bedouins. It was all so interesting! Did you know there’s a plant that can be used as a natural mascara? Oscar explaining the medicinal usage of this plant. It was all so interesting! Different traces in the sand would reveal who was sniffing around before our Rover appeared. 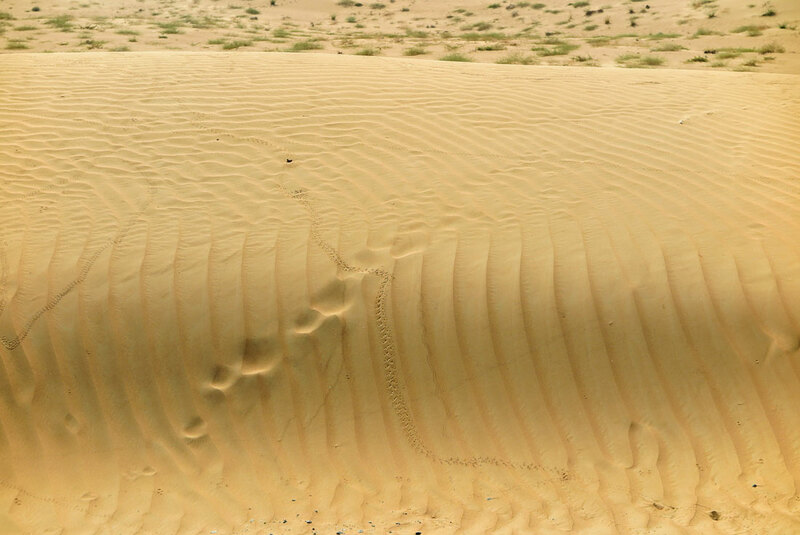 Towards the end of the safari, we’re let out to run up and down a dune and explore the comparatively lush surroundings. You can see a few trees and a small lake which is, unsurprisingly, very popular among local animals. The sand is so smooth that I have to remove my flip-flops and let it flow between my toes. It’s a real bliss! The whole time you’re riding around Dubai Conservation Reserve only. That means it’s only a designated area that doesn’t disturb the animals and people can get off the Rovers only at special spots. Only Platinum Heritage is allowed by the government to operate in the Reserve. Also, there’s no dune bashing involved. 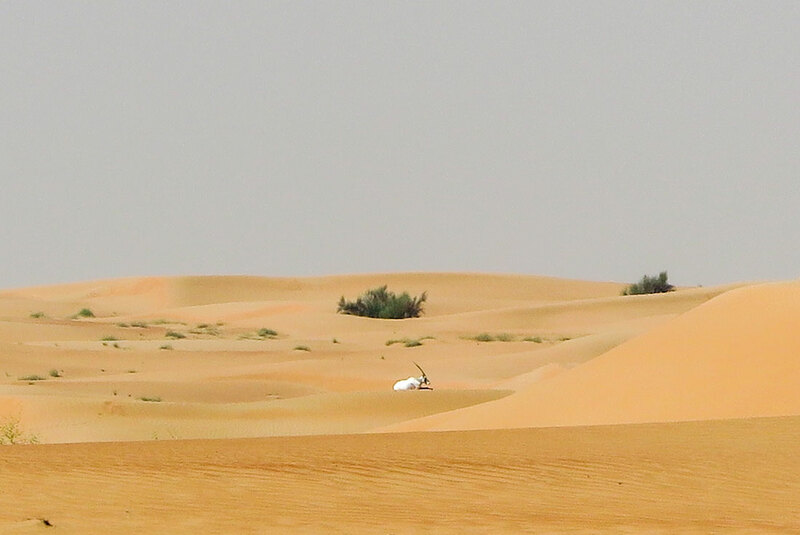 Some companies in Dubai do offer tours like that but please consider staying away from dune bashing. 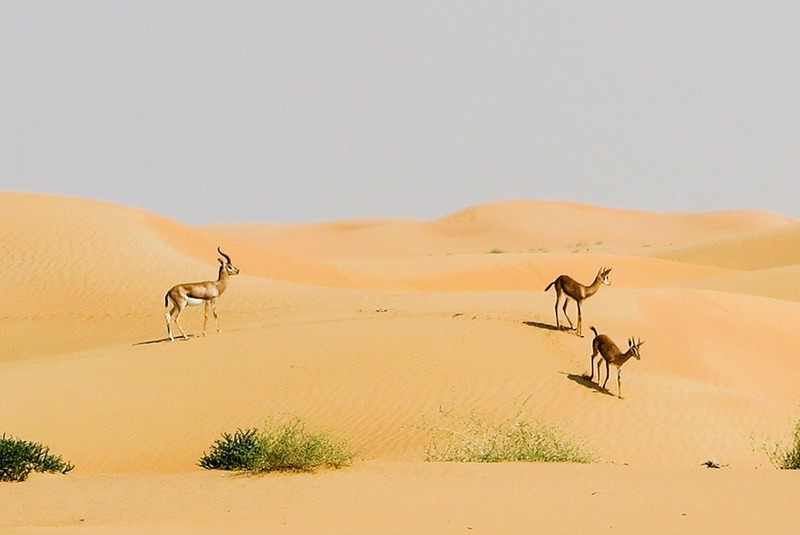 There are many animals living in the desert, from the tiniest insects to the gazelles and their habitat is compromised if there’s a bunch of people riding up and down sand dunes like crazy. The adventure doesn’t stop! It was real fun to ride a Rover in the desert. No dune bashing involved, though. Desert is not always just pure sand! 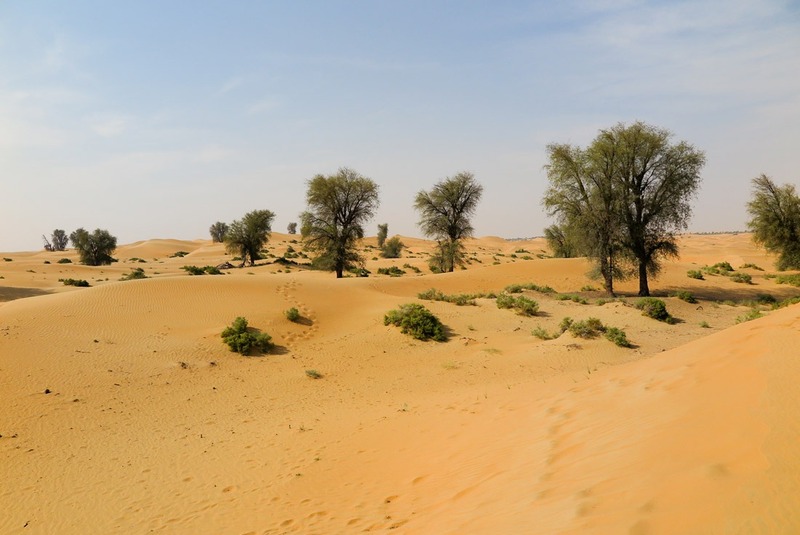 The national tree of UAE, the Ghaf, has roots 6x longer than the surface part of the trunk. Lonely oryx in the desert, seemingly just waiting for his life to be over. A driver picks you up from your hotel in Dubai at the set time. He then drives you and others who’re staying in the same area to the designated location further away from the city of Dubai. You’ll actually be going quite far – some 50 kilometers from the city. You arrive at the take off spot right before the sky starts turning lighter from pitch black. All minivans are disembarked and people are divided into groups to fly different balloons. Everyone is given quick safety briefing and it’s on the captains from then on! 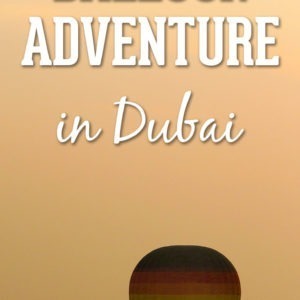 I flew with Balloon Adventures Dubai. From my research, they seemed the most experienced and made me feel comfortable enough to overcome my slight nervousness connected with first time flying. Make sure to be waiting for your driver to pick you up at your hotel before your agreed upon time! You don’t want to be late, because you’d miss the whole experience. You see, the sun doesn’t wait and so your driver can’t either. 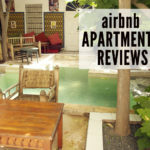 If you’re not to be found in the hotel lobby, you’re off the list and no refund will be made. Also, don’t forget to go to the restroom right before. The first option to use a toilet is only after the hot air balloon ride, at the breakfast location. Wear some loose clothing of light colors that’ll warm you up if the early morning is cold in the desert but at the same time will let enough air around to provide some relief from heat once it gets too hot. Sandals are fine, even flip flops, but preferably the kind that’s attached to your feet. Of course, weather can turn bad. That’s actually always watched for and in the case of bad weather, the hot air balloon ride is cancelled and the guests are either rebooked on a different date or fully refunded. One of the classy Rovers. Seriously, go with this company! 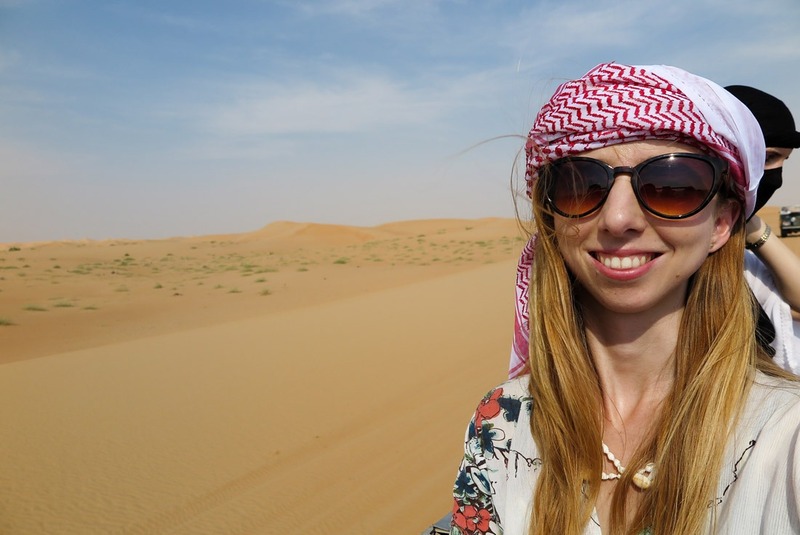 The whole idea came to me when planning what to do on a stopover in Dubai. I had about 18 hours in Dubai on my way back from the Philippines and decided to make the most out of it. This hot air balloon experience absolutely exceeded my expectations. 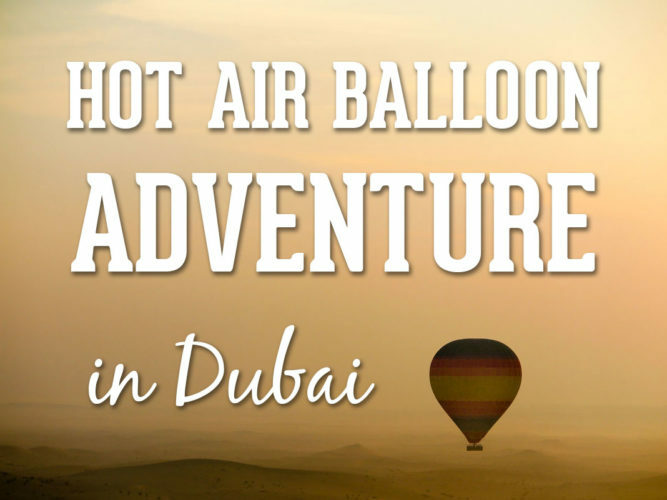 There’s a lot to do in Dubai and I did quite some sightseeing, but flying in a hot air balloon in Dubai? That really stood out. One thing you have to be aware of: it’s pricy. As are all things in Dubai. But if you’re looking for an experience of a lifetime and hot air ballooning is not your everyday activity, the investment is well worth it. 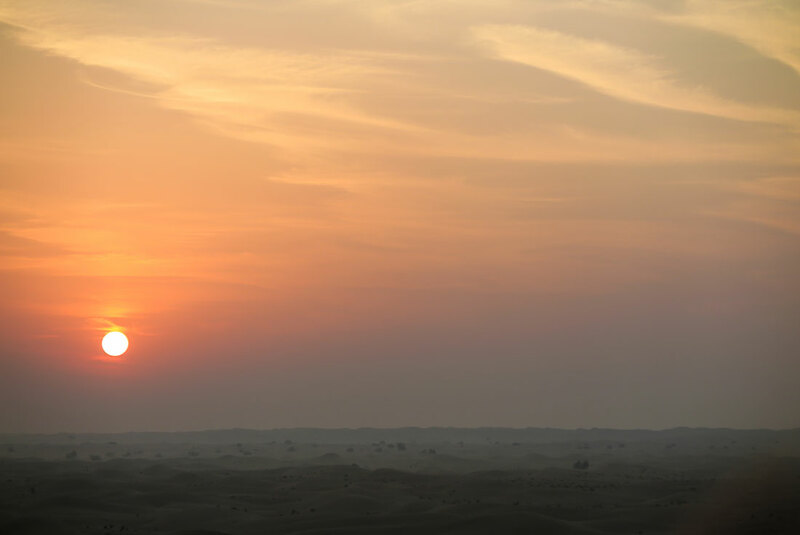 In my opinion, hot air ballooning is one of the best things to do in Dubai. 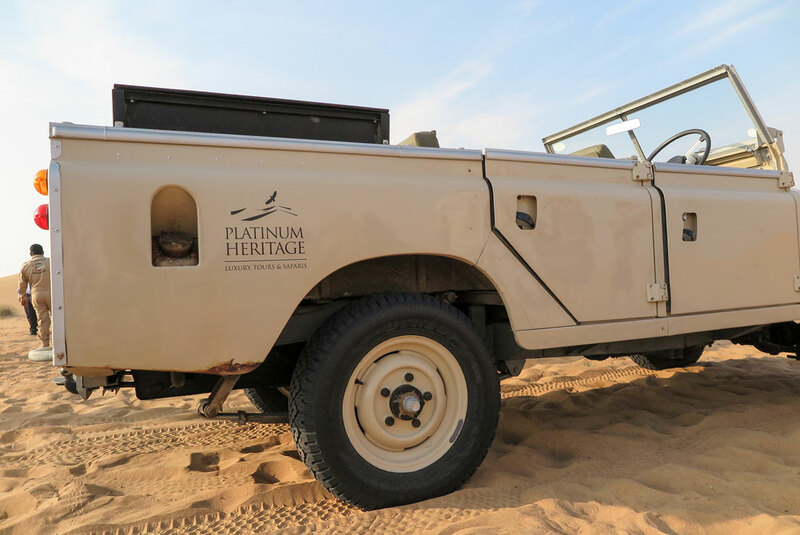 Platinum Heritage for the desert safari or for a combo made up of hot air balloon ride, breakfast and falconry combined with the desert safari (that’s the one I took). Have you ever flown a hot air balloon? Where was it and what was your experience? Pin this article to your travel boards. It’ll come in handy once you’re planning your trip to Dubai! 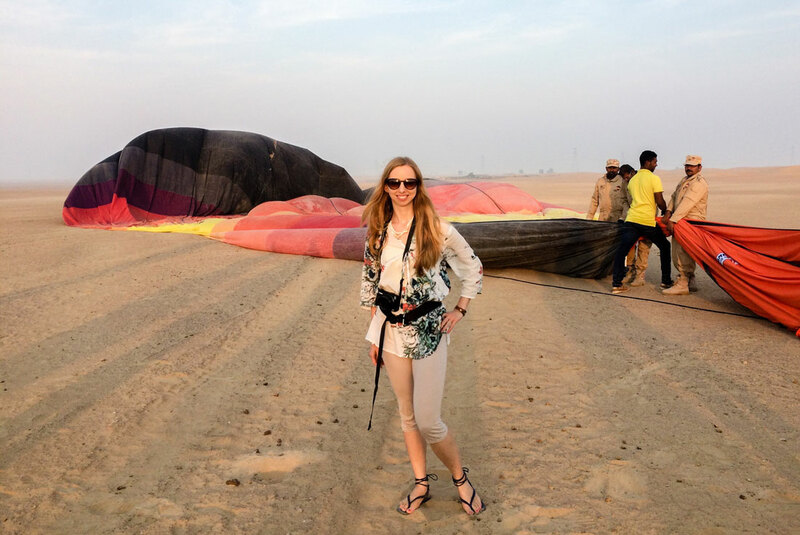 Disclosure: Veronika ended up being hosted by Ballooning Emirates and Platinum Heritage. All our opinions and views are, however, Veronika’s own and unbiased. What an extraordinary experience! 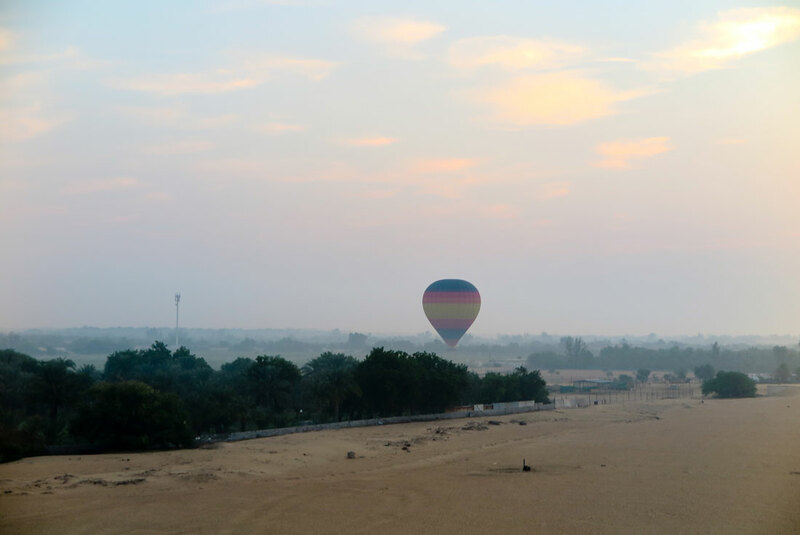 I have never gone on a hot air balloon ride so it was so interesting to follow along on your ride. It’s been on the travel wish list for awhile now. 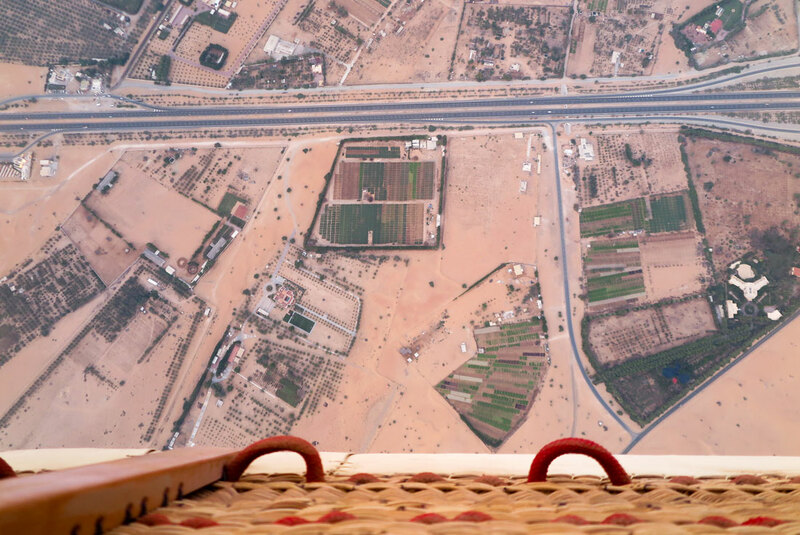 I didn’t know you could even do a hot air ballon ride in Dubai but what a view and landing. Thank you, Mary! I think Dubai is one of the best locations to fly for the first time.. :) At least with this company, as there are real pro pilots from around the world. I heard about flying in Capadoccia, Turkey – there it must be gorgeous too! Wow great experience and beautiful images. I really want to visit Dubai one day. It looks great. 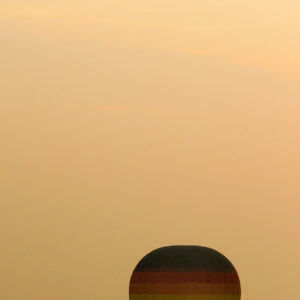 Hot air ballooning is definitely great in the desert since the sky is almost always clear. Food looks delicious, glad you enjoyed your time Veronika! What an amazing looking experience … might have to try this when I get to Dubai! Really amazing and motivating!! Got to try these specially the falcon thing, would love to see that.